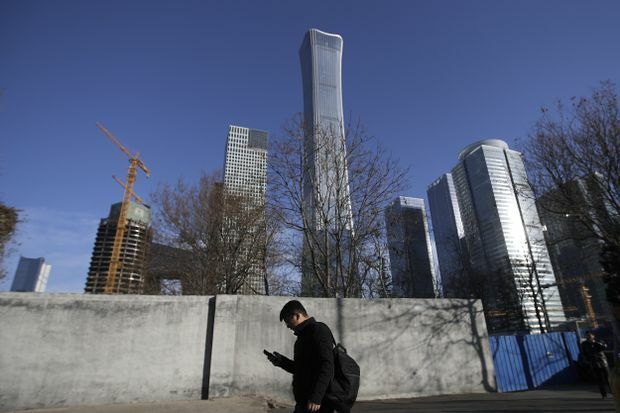 A man browses his smartphone as he walks by the skyscrapers under construction at the Central Business District in Beijing, on Jan. 21, 2019. Growing signs of weakness in China -- which has generated nearly a third of global growth in recent years -- are fuelling anxiety about risks to the world economy and are weighing on profits for firms ranging from Apple to big carmakers. Demand is weakening globally, not just in the United States. Net exports actually dragged on China’s growth by 8.6 per cent last year, Reuters calculations based on official data showed.